Specialised food & treats, high quality cages, toys, accessories and supplements for your Parrotlet. Order Parrotlet specialised food & treats, interactive toys, spacious, quality cages, natural perches, necessary accessories and supplements. 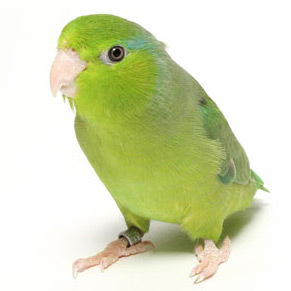 Look no further, Parrot Essentials has all you need for your Parrotlet. Browse our food & treats, interactive toys, quality cages, natural perches, necessary accessories and supplements. We have a huge variety of high-quality food products for your bird. Choose from our great selection which includes seed mixes, complete pellet diets, treats, breeding & hand feeding formulas. When you’re wanting to enhance your bird’s diet, add in a few treats. Treats are an essential element to a bird’s life, perfect for training, playtime and a light snack. If you’re needing supplements, we always have a great selection to keep your Parrotlet healthy. Our range of products not only include supplements focusing on the daily health care of your bird, but it also extends to medicine and healthcare products for treating bird ailments. Provide your Parrotlet with a comfy, safe home. No matter what kind of cage you’re looking for, we are sure we can provide you with the perfect one. Choose cages like open top, play top, solid top, and/or travel cages suitable for parrotlets. In addition to cages, we recommend providing your bird with a stand. Stands will give your Parrotlet additional play space! We have a choice of floor standing or tabletop stands. Your feathered friend needs lots of interaction and mentally stimulating activities throughout the day. With our toys, provide hours of fun and keep the boredom away with our wide range of foot, foraging, natural, and puzzle toys. Your bird is very intelligent so play-time is a must to keep them healthy and happy. Lastly, we recommend you browse our selection of accessories. From perches, feeding dishes, harnesses, lights, stand and cage covers, cleaning supplies and more, you’ll find any extra necessities suitable for your bird.